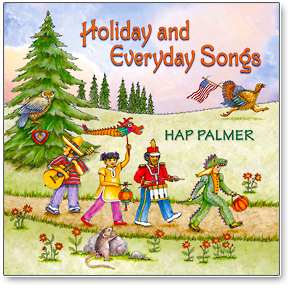 This is a collection of songs about holidays throughout the year combined with songs about special things that happen every day. A wide variety of musical styles from the joyful mariachi trumpets of Cinco de Mayo, to the spooky sounds of Halloween Hike celebrate holidays for every season. On Martin Luther King Day, lift your voices together to show We Have A Dream. Let the drums and cymbals inspire your dragon dance as you sing Xin Nian Kuai Le to say Happy New Year in Chinese. Share a gentle message of friendship and caring with the Valentine's Song. Birthdays are made extra special with the Birthday Medley of four cheerful songs. You can choose one or do them all! Celebrate 4th of July with a blending of two classic American music styles – bluegrass and Dixieland jazz in Happy Birthday USA. Liven up any party with a spirited game of tag as the little mice Scamper away from the hungry cat! 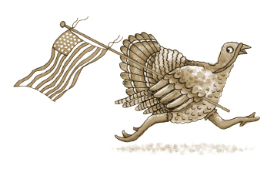 clap and laugh with A Turkey Tale and cheer the feisty turkey as it evades the farmer on Thanksgiving Day. As the days grow shorter, celebrate winter solstice and Christmas with the Sheltering with the Sheltering Evergreen Tree; then sing the song again in the spring for Arbor Day. Every day is a day to be thankful for Food in its many healthy varieties, and to wake up with the animals in Morning Time At The Zoo. Imagine a more harmonious world on the International Day of Peace as you sing Ki Va Moed, to say, "Now is the time." On Earth Day, or any day, marvel at the miracle of life with Nature's Sweet Endless Song and when you take time to notice seemingly ordinary things you realize the central theme of this album, Every Day's A Special Day! Lynne Heffley ©2016 Parents' Choice – A freelance writer and editor for the arts and non-profit organizations, Lynne is a former staff writer for the Los Angeles Times, where she established the paper's first weekly children's arts and entertainment beat. 5. (23) Happy Birthday U.S.A. Numbers in ( ) are instrumentals of the songs. The instrumental versions include the complete track minus the vocals. After you learn the words to a song, you can sing along hearing only the music with a soft piano melody to guide you. The instrumental versions are ideal for accompanying groups in holiday assemblies and concert performances.